Boy’s Movie. In 3D. Serves its purpose of getting thirteen-year-old boys interested in slim blond girls with indeterminate Euro accents and tennis-ball ta-tas. Brendan Fraser has some nice ta-tas too. All that sweaty tight t-shirt adventure with the Running and Screaming and CGI completely outa control. It’s been decades since I’ve read Jules Verne’s Journey to the Center of The Earth, but I can safely say this movie is only “loosely based” on Verne’s book. Very loosely based. They really lost me on the INDIANA JONES mine-cart ride… when three mine-carts jump a precipice (with no approach ramp) and land on the opposite side, exactly on their tracks – a stretch of fantasy even Jules Verne would never ask of us. More concerned with inserting 3D wonderama moments than any plausible explanation on how humans can survive the bone-crushing pressures at the Earth’s core, JOURNEY TO THE CENTER OF THE EARTH quickly takes our heroes to a subterranean world within this world. 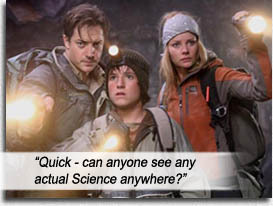 Brendan Fraser is the scientist mocked for his “hollow Earth theories,” Anita Briem is the indeterminate Euro chick and Josh Hutcherson is this movie’s own target audience 13-year-old boy, who discover a pocket of ecosystem near the Earth’s center, where they encounter luminescent birds, floating magnetic rocks, and the perfunctory tyrannosaur. Every new iteration of CGI tyrannosaurs keeps getting better and better. This is the best you will ever see. Until the next iteration. Though it contains a smidgen more “science” than the 1959 movie of the same name (starring James Mason doing his best – uh, James Mason), we must note that this 1864 tale was written by a guy interested in “science” as adventure fantasy, not as scientific fiction, like Clarke or Asimov. So the crushing atmospheres above our heroes’ heads is never mentioned. Or there would be no movie. No popcorn. No ta-tas. Verne did try to convey a sense of evolution though, the surroundings and fauna becoming more prehistoric the deeper the characters went; a jot of that concept remains when Brendan Fraser ejaculates every ten minutes about the exciting rock strata that no one else is interested in, including the audience. Get to the dinosaurs, willya! Directed by first-timer Eric Brevig, JOURNEY goes deep, stays shallow. For the thirteen-year-old boys. And when the temperature rises so high it forces Anita Briem to strip down to sweaty tank top and short shorts, Science is the last thing they’re thinking about… well, maybe biology. Writers: Michael D. Weiss, Jennifer Flackett, Mark Levin, Jules Verne. Starring: Brendan Fraser, Josh Hutcherson, Anita Briem, Seth Meyers, Jean Michel Paré, Jane Wheeler.